Eden Hazard has been named Football Writers' Association Footballer of the Year. The Chelsea forward's outstanding season has now been recognised by both the press and his peers after he won the Professional Footballers' Association equivalent last month. And the vote for Hazard, whose winning goal agaisnt Crystal Palace earlier this month clinched Chelsea's fourth Premier League title, means the same player has won both awards in each of the past four seasons. Tottenham striker Harry Kane came second in the poll ahead of Hazard's Chelsea team-mate John Terry. FWA chairman Andy Dunn told Sky Sports News HQ: "We have 270 members and we had a turnout of over 90 per cent, and 53 per cent voted for Hazard. 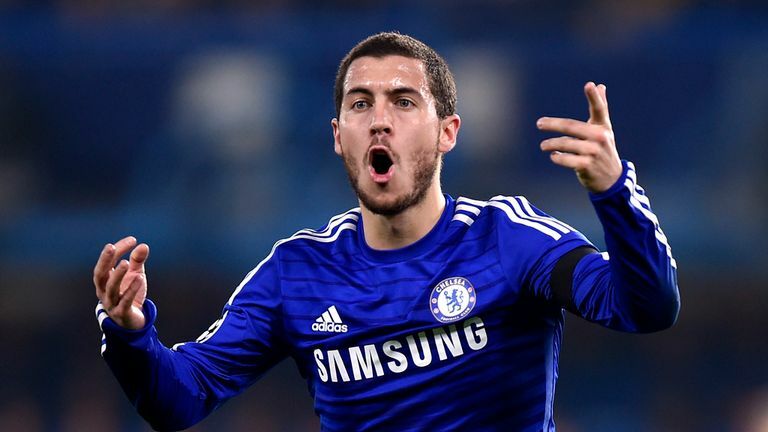 Adam Bate explains why FWA Footballer of the Year winner Eden Hazard got his vote. "It wasn't overly close, but there were some interesting votes around. There was a late groundswell of support for John Terry after his performances in recent weeks, and our members were also captivated by the Harry Kane story. "There were votes scattered around for the likes of Sergio Aguero, David de Gea and also one for Esteban Cambiasso, but the majority looked at Eden Hazard's contribution to Chelsea's title-winning season - magnificent as it was - and decided he was the pivotal man." Hazard is also among 10 nominees for the PFA Fans' Player of the Year award, due to be announced on May 26.